We're thrilled to announce that Macmillan Children's Books has won both Independent Bookshop Children's Awards! 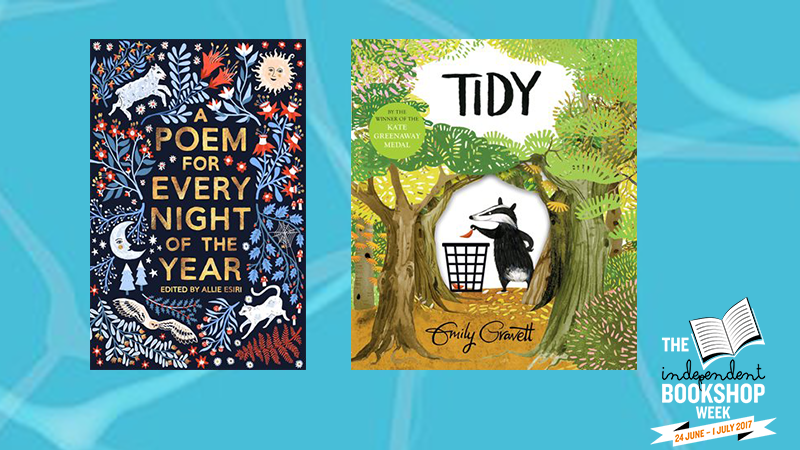 Tidy by Emily Gravett wins the Picture Book Category and A Poem for Every Night of the Year edited by Allie Esiri wins the Children's Category. Congratulations also to Sebastian Barry, whose novel Days Without End won the Adult Category. Our judging meetings were lively sessions, as both panels debated three very impressive shortlists. This did, however, lead to three inspiring and life-affirming books winning, all of which independent bookshops are sure to love to hand sell. On behalf of the BA, I would like to congratulate Sebastian, Allie and Emily on their thoroughly deserved award wins! I am flabbergasted but deeply honoured to receive this IBW 2017 Children’s Book Award. As well as containing a poem for each and every night of the year, the book is a journey through a calendar year celebrating the seasons, diverse cultures and notable historical dates. I am passionate about sharing poetry with the widest possible audience and am so grateful to all independent bookshops who have championed this anthology and indeed for everything they do. I believe that poetry, as well as being the best expression of the big stuff, also exists for the small, seemingly insignificant things in life, for the everyday. Wordsworth once wrote of beauty ‘felt along the heart’, like waves beating along a shore. We feel poems along the heart and although we may not immediately notice the impact they make, they leave the shores of our heart a little changed. Thank you to Macmillan, to the illustrator Zanna Goldhawk, and to all the poets dead and very much alive who are, of course, the real heart of this book. I am thrilled to win this award. I love independent bookshops - their individuality and character, the passion of the people who run them, the breadth and variety of books on their shelves. The personal service they offer is such a pleasure, and important, too, especially in the way a good bookseller can match child and book.